We invite you to share your films and videos with a live audience. Any genre! Any style! It can be old, new, or a work-in-progress. We want to see it. Submit work by May 17th! Email: yayforfilm@gmail.com You can also bring work the day of the show – but arrive early, it’s first come, first served, as time allows! There will be a short discussion after each film/video with a chance to gather feedback from the audience. 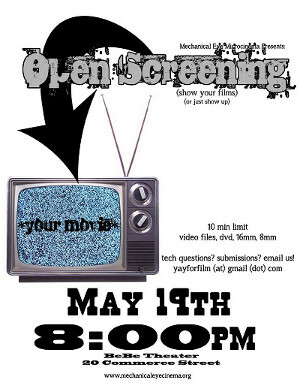 Even if you don’t have a film or video you want to share, you are invited to be a part of the audience. Support local media makers and see exciting work you’ve never seen before.